No one can get elected in India without promising bijli, sadak, paani (electricity, roads, water). It has long been clear that the first promise cannot be fulfilled without using clean energy, especially in off grid areas. Many solar energy entrepreneurs are trying to fill this gap, but they often complain of the difficulty in accessing bank loans for their projects. Bankers, in turn, complain that they cannot get any collateral. The one solution that is working is for government and international organizations to stand guarantee for the loans, a process that needs urgent scaling up. A day before the special climate summit convened by the UN Secretary General, international think tank The Climate Group described one such project they are carrying out in three Indian states, aiming to benefit around 50,000 people by the end of next year though originally they were expected to cover 5,300. The project, called Bijli, is being financed by Dutch Postcode Lottery (DPL). Marieke Van Schaik, Managing Director of DPL, said it was working so well that her organisation was thinking of financing similar projects in India and elsewhere. Namita Vikas of Yes Bank said that for financiers to support such projects there should be minimum uncertainty about the functioning of the economy. She said that a project to provide solar energy only to households was not very likely to get a bank loan, but the chances improved tremendously if the banks knew that telecommunications firms would set up mobile towers there and would use that electricity, and so would firms marketing fast moving consumer goods for applications such as refrigeration in shops. Steve Howard of IKEA felt that government policies would become less important “as solar prices come down due to scale.” His company had started selling solar panels, and he expected prices to halve in the next ten years. 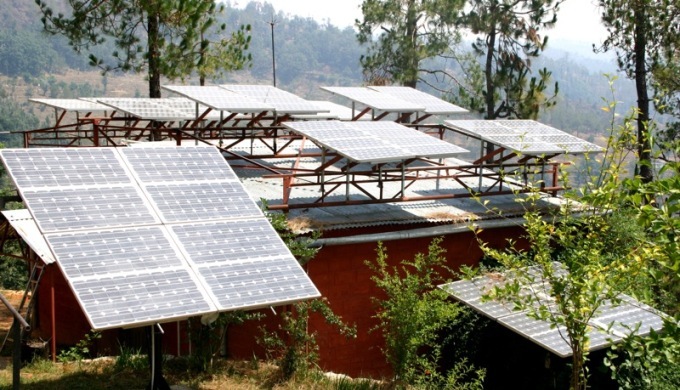 The Climate Group, which brought together industry leaders and international organisations such as the UN and the World Bank a day before the informal climate summit, said the Bijli project also aims to identify sustainable off-grid renewable energy business models, address the challenges of scaling up clean energy solutions to benefit large numbers of people by developing viable financial mechanisms, and help Indian businesses and communities to help lead and benefit from the emerging global low carbon economy. The project is delivering solar lanterns, home-lighting systems and micro-grids in Maharashtra, West Bengal and Uttar Pradesh. Of course, such projects could become far more viable if there was a significant price on emissions of greenhouse gases – mainly carbon dioxide – which are accumulating in the atmosphere and changing the climate. Ahead of the informal climate summit, 73 national and 11 regional governments responsible for 54% of global greenhouse gas emissions, and more than 1,000 companies and investors have expressed support for putting a price on carbon. The supporters include China, Russia, European Union, Indonesia, Mexico, South Africa, The Philippines, Kiribati and Nauru. These national governments have joined governments in states and provinces like California and Quebec, cities like Tokyo and Rio de Janeiro, NGOs like the Environmental Defence Fund, and firms such as Nokia, LG Electronics, Lego and Shell. “By supporting a price on carbon, leaders from across the political and business world have come together to send a strong signal that they will build their economies for a safer, cleaner, and more prosperous planet,” said Jim Yong Kim, President of the World Bank Group. The growing support is clear recognition that carbon pricing, whether by carbon taxes, emissions trading systems or other means, is a necessary part of the solution to drive investments in a cleaner economy, and a foundation on which other climate actions can build.